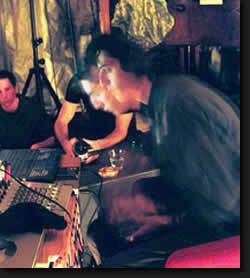 Joel Stern is a sound artist exploring electroacoustic approaches to composition and free improvisation. He uses field recordings, contact microphones, found objects, digital processing techniques and simple feedback systems to producing works which move between richly textural surface noise, investigations of acoustic space, and minute gestural detail. He has performed solo and collaboratively all throughout europe, japan and new zealand as well as at all the major experimental music spaces in australia including What is music, Liquid architecture, The Nownow, Articualting space, Impermanent audio, Small black box, fabrique, make it now and in toowoomba. joel currently plays with brisbane free noise bands Impromtulons and No guru. Joel is equally interested in film, especially avant-garde and experimental film, and especially especially strange and unique examples of film sound. He has written and lectured at Queensland Universtiy of Technology on this subject and has designed sound and composed scores for a number of independent film projects. in 2004 he was invited to Cannes Film Festival with the film ‘Footnote‘ (directed by Pia Borg) for which he designed the sound. His cheif collaborator is filmmaker Sally Golding, and together they formed abjectleader in late 2004, a project which encompasses live expanded cinema performance, avant-garde film screenings, and filmmaking workshops. Joel also co-runs the record label Naturestrip which specialises in publishing sound and art that incorporates environment (wheather industrial or ‘natural’) into compositional frameworks. He has been involved with radiophonic art and presentation and has presented programs and work on 3RRR (Melbourne) and ResonanceFM (London) and currently co-hosts the 4ZZZ (Brisbane) program audiopollen with Lloyd Barrett. He has performed and produced work for galleries, theatres, pubs, and squatted indian restaurants throughout Australia and Europe and has released music on labels including Impermanent, TwoThousandAnd, Touch, Groundfault and Paradisc. Since 1999 Joel Stern has performed his music throughout the UK, Europe, Japan, New Zealand, and Australia with musicians including Anthony Guerra, Mattin, Takehiro Nishide, Jim Denley, Matt Earle, Adam Sussman, Peter Blamey, Mattin, Scott Sinclair, Dave Brown, Anthony Magen, Rhett Wade Farrell, Impromptulons, No Guru, Gyanism, Joe Musgrove, Clayton Thomas, Tony Buck, Michael Rodgers, Alison Blunt, Blind Plastic, we are your executioners, Splinter Orchestra, Nylstoch, Rhodri Davies, Matt Davis, Philip Samartzis, Oren Ambarchi, Takefumi Naoshima, Toshihiro Koike, Sawako, Arek Gulbenkoglu, Will Guthrie, Werner Dafeldecker, Bonnie Hart, Michael Northam, Jonathan Coleclough, Paul Hood, Brisbane Noise Orchestra, Shannon Doherty, Adam Park, Murmer, Lloyd Barrett, DZO, Jamie Hume, Robbie Avanaim, Mark Wastell, Romauld Wadych, Matthew Hyland, Cristof Kurzmann, Wykopoliska, Denis Dubotsev, Blase Roccasano, musicgroupmusic, Ai Yamamoto, Erik Griswald, Anthony Pateras, Rod Cooper, Matjaz Mancek, Margarida Garcia, Juha Valkaapia, Ross Lambert, Rohan Thomas, Tarab, Tom Chant, Seymour Wright, Dan Beban, Sic Goldie, Alastair Leslie and countless others. thanks to all of them.